Glamorize your home with Eglo's Trevelo LED pendant light! Eco-friendly and certified Energy Star, not only will the fixture decorate your space, it will help you lower the electricity bill! Its chrome finish with clear crystals will compliment any work or home environment, it's a purchase you won't regret it! Designed with soft illumination and rich designs in mind, the Caramel family is a sensual delight. A central band of swirling patterns is topped by a curtain of crystal strands, and finished with a beautiful double layer of ornamental crystal designs. The glowing clear amber effect that will bathe your setting is an epicurean delight. Nautical meets industrial with Globe Electric's Shilo 1-Light Pendant. A galvanized finish paired with exposed screw caps creates a wonderfully unfinished industrial look yet the exposed bulb and smooth to the touch design keeps this pendant in the nautical family. The included Globe Electric vintage Edison t-shaped bulb completes the look. Hang this pendant alone or pair it up for a cohesive style throughout your home. Perfect for a kitchen, living room, dining room, bedroom or rec room, the Shilo Pendant is extremely versatile and complements any dicor. Includes all mounting hardware for quick and easy installation and one E26/medium base t-shape 60W bulb. 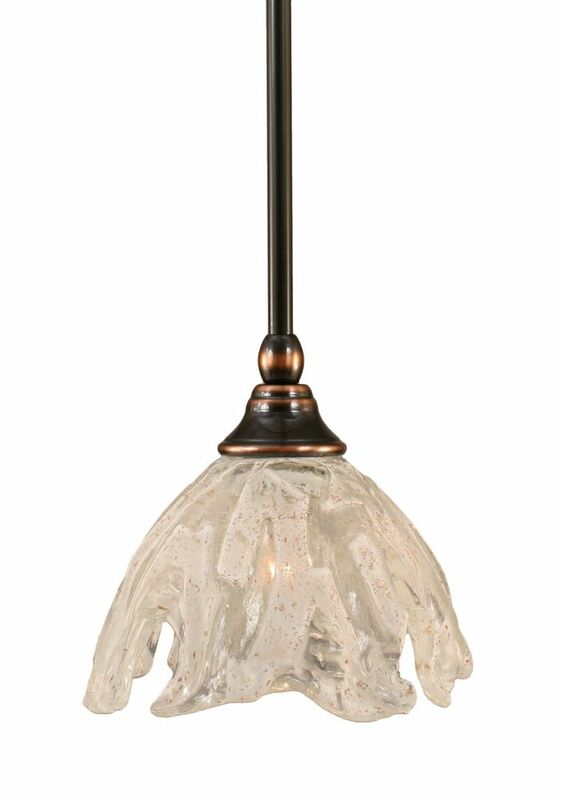 Concord 1-Light Ceiling Black Copper Pendant with a Clear Crystal Glass The cornerstone of the concord Collection is quality, and this pendant is no exception. Combining a classic black copper finish and posh styling, you will find no better way to highlight the charm of your home. With the superb craftsmanship and affordable price this fixture is sure to tastefully indulge your extravagant side.